Phwew, they snuck this one in last night while I was prepping my usual Farm Town Friday Update, so I only now had a chance to work through them. Sorry for the delay. I thought Zynga would have released these quests when they added the Training Stall earlier this week. Wonder if they forgot. Oh well. Have a look at what’s waiting for you in the quests to come. Hope it helps? Water 8 Trees – Do Lemon, Olive and/or Pine. You’ll need to harvest them later. Harvest 25 Sunflowers – 1 day grow time. Some people only have to do 15. Made it to the end! Phwew! I hope this post is helpful to you. Please share it with your friends. If you have any tips of your own, please add them in the comments below! FarmVille 2 is a trademark of Zynga Game Network. All images are the copyright of their respective owners. This article is copyright 2013 by The Facegamer. Do not copy or reproduce without permission. All right reserved. Last night’s update provided us with something new to play with: the Horse Training Stall. Remember the piggy’s Mushroom Shed? This is like that. Four weeks of quests that you can do in any order, with a reward for each week and a final reward of a pretty new horse at the very end. I am very underwhelmed by this update, especially compared to last week’s really fun cow bells update. I am hoping that the next three weeks will prove to be more enjoyable. 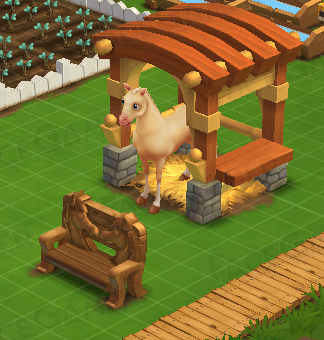 This week's reward, a horse bench, is really quite cute. 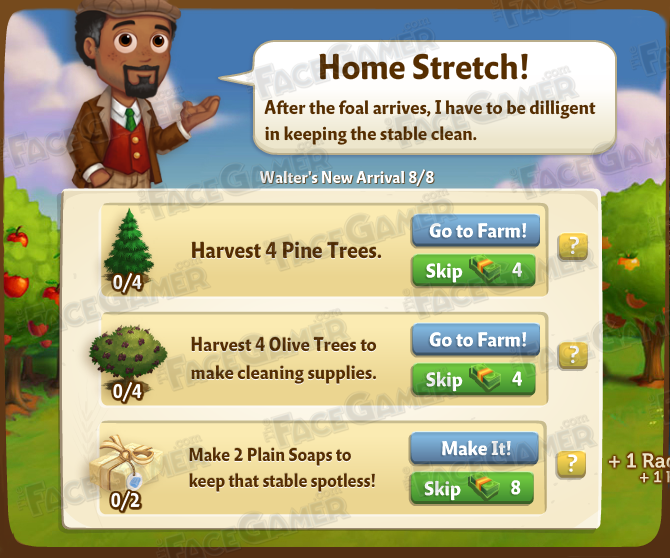 Here is a link for 3 free water for Farmville 2. Thanks to Rebeka for the tip. We think comes from an email from Zynga, so it’s possible you may already collected it. Hopefully it will work for you.. enjoy! If you have a tip you’d like to share about FarmVille 2 or any other game, please send it to us via our About/Contact page. Thanks!